Somewhere there is probably a Bateman cartoon: ‘The Man Who Was Not Interested In Snowdrops’. Gardening mavens swoon, geeks glare and collectors point accusing fingers. And in the middle is the Man himself, a shrivelling heap of embarrassment. I know how he feels: a few years ago I turned down an invitation to a ‘Snowdrop Lunch’, where galanthophiles (yes, that is the word for snowdrop fanciers) would discuss all things snowdrop and analyse the tiniest variations they have found in snowdrop seedlings. These are people who, with the briefest of glances, can tell the difference between Galanthus peshmenii and Galanthus panjutinii; I, on the other hand, am hard pressed to identify something as common as Galanthus ‘Magnet’. I had to admit my lack of interest and decline the lunch. I could sense the shock and incredulity my admission caused. (I didn’t own up to my terror at the prospect of being found wanting). I am not a galanthophile. But I do love snowdrops and each winter yearn for their reappearance. Just as you think that you can’t take more of the muddy walks with the dog, the bone-chilling cold or the cruel, biting wind the snowdrops appear to remind you that the winter will end, that the days will lengthen and that Spring is on its way. The other plant that flowers just as early, and sometimes earlier is the winter aconite, Eranthis hyemalis, but its yellow flowers just don’t have the allure of the milky white flowers of snowdrops. (Galanthus is derived from the greek ‘gala’ meaning milk and ‘anthos’ meaning flower). The ones I have in the garden is the common Galanthus nivalis, the same species that fills the woods and edges the lanes around us here in Hertfordshire. For me snowdrops are plant to be seen en masse, clothing the black, cold soil or embroidering a meadow. Picking a few for indoors (rather than cut the stem, pull it up gently out of the bulb) means that you can appreciate their delicate perfume. 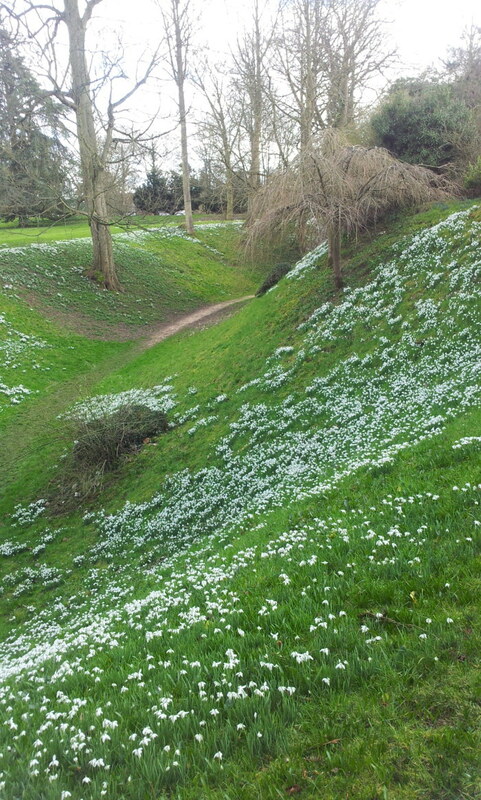 There are lots of parks and gardens that open to show off their snowdrops. Close to us is Bennington Lordship, a Georgian manor house whose gardens contain the remains of a Norman castle. I wrote about the garden’s snowdrops a few years ago for Gardens Illustrated magazine to beautiful photographs by Rachel Warne. 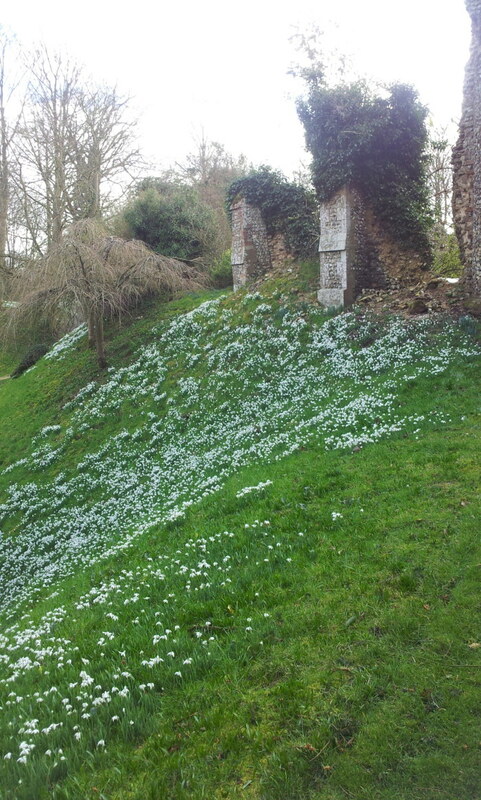 The moat of the castle and much of the outlying garden is carpeted with snowdrops. This year I noticed that there was a small display bed with dozens of different snowdrop hybrids, protected by a low fence to prevent pilfering by fervid collectors. Seeing clumps of individual cultivars up close, I began to make notes (always a dangerous prelude to a spending spree). I was attracted by the bold flowers of Galanthus ‘Galatea’, that was 25cm (10in tall). I discovered that it was raised in the 1890s and is a vigorous plant. Nearby was a large clump of a snowdrop just 10cm (4in) tall with green smudges on each petal : Galanthus nivalis ‘Viridipice’. A frilly, double flower with green-edged petals called Galanthus ‘Hyppolyta’ also got noted. 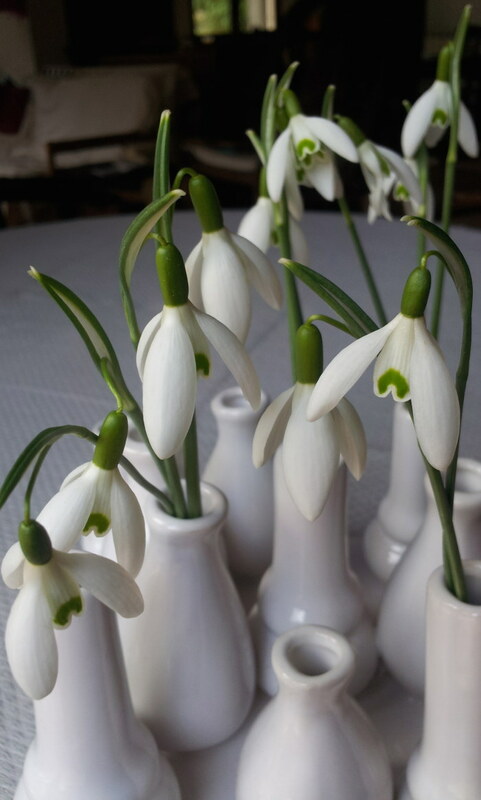 And so a surprising things happened: I took out nursery catalogues, went on line and started ordering snowdrops. I avoided the eye-watering prices (who is that pays £200 for a single snowdrop bulb?) that some nurseries charge. My most expensive purchase was for a very heavily-scented hybrid called Galanthus ‘Brenda Troyle’, for whose presence in my garden I paid £4 per bulb. I bought my bulbs from Pottertons Nursery and Eurobulbs and all the bulbs I received were fat and healthy. I don’t have the discipline and dedication to become a snowdrop collector, but I am happy with the dozen varieties I have just bought. Maybe one day I might, again, be invited to a Snowdrop Lunch. And fearlessly accept. Snowdrops are unfussy, adaptable plants that will grown in sun as well as shade and push though lawns, leaf litter and even other plants. In France they are known as ‘perce-neige’ – pushing through the snow. The are at their best cool situations that have deep, fertile soil. The bulbs like a dry summer but will not thrive if they are baked to the point where they dry out completely. 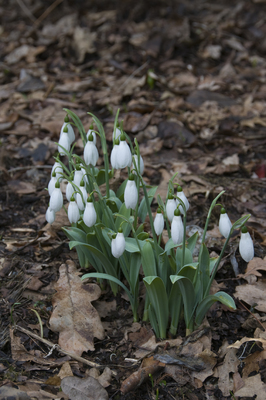 The easiest to naturalise in grass or under trees and shrubs is Galanthus nivalis. 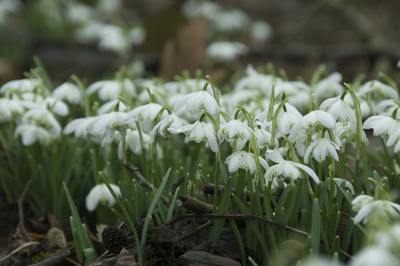 Most snowdrops increase rapidly from bulb offsets and by seeds, that are spread around by ants. Remember that seedlings will differ from their parents so if you have a swanky named hybrid don’t let it be overrun by seedlings. 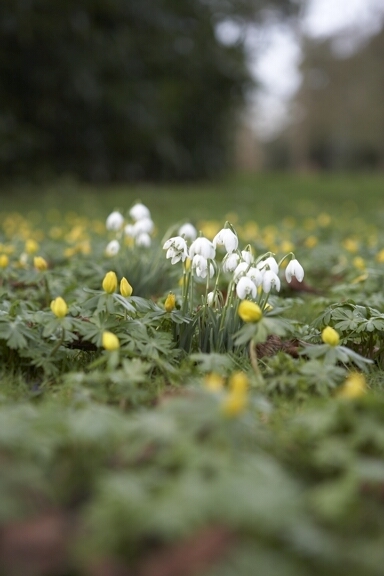 In Britain snowdrops are planted ‘in the green’, that is to say while they are still growing. Specialist nurseries send their bulbs out to customers in February and March wrapped in damp compost. Plant the about 10cm (4in) deep. Don’t let the bulbs dry out before you plant them. In the rest of Europe nurserymen do sell dry bulbs and I have had great success planting the dry bulbs of Galanthus elwesii – a sweetly-scented species with flowers 22cm (9in) tall that has broad, grey-green foliage. Dried bulbs are less expensive than those sold in the green, but make sure that they are fat and plump, not thin and shrivelled.